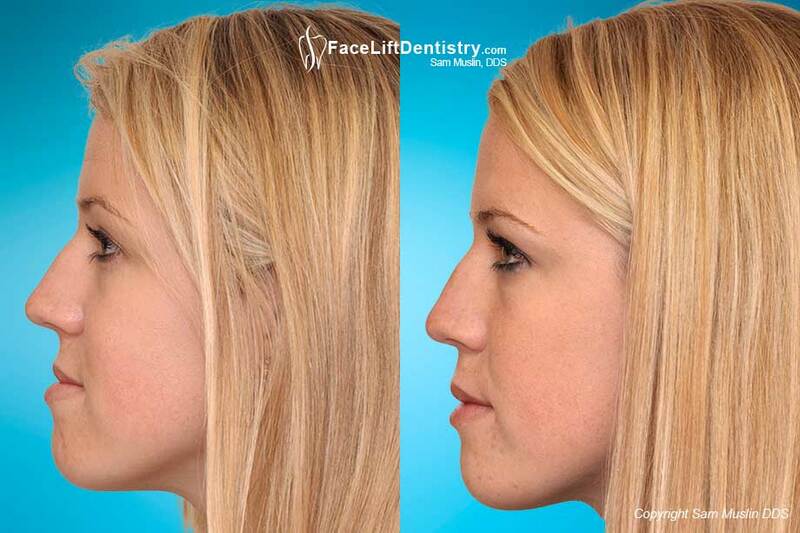 The Non-Surgical Face Lift that Works! Is There a Non-Surgical Face Lift that Works? 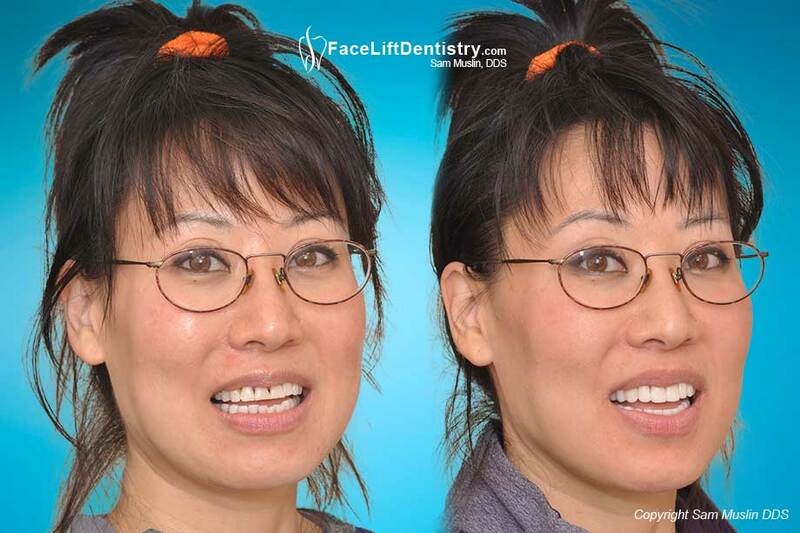 She did not want a surgical face-lift and she also did not want jaw surgery and braces for overbite correction. 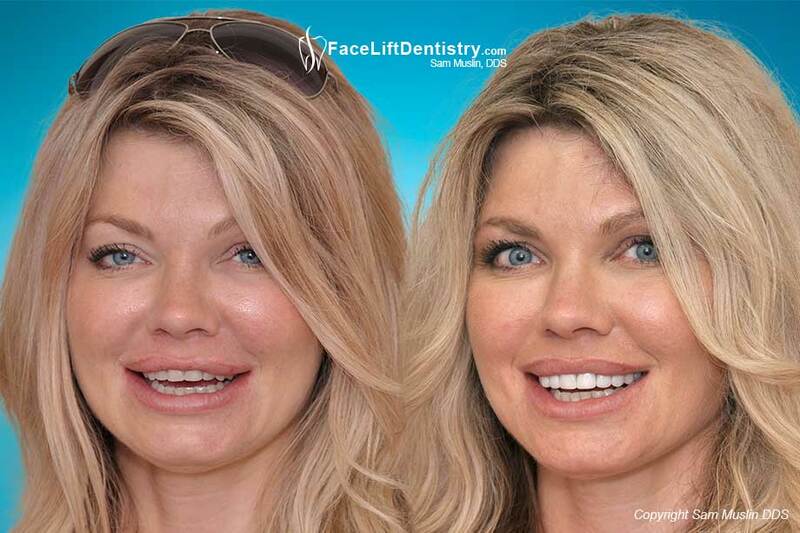 She just was not interested in dental care that would drag out over a period of years with time in the hospital and time away from work to recover from the surgical face-lift. 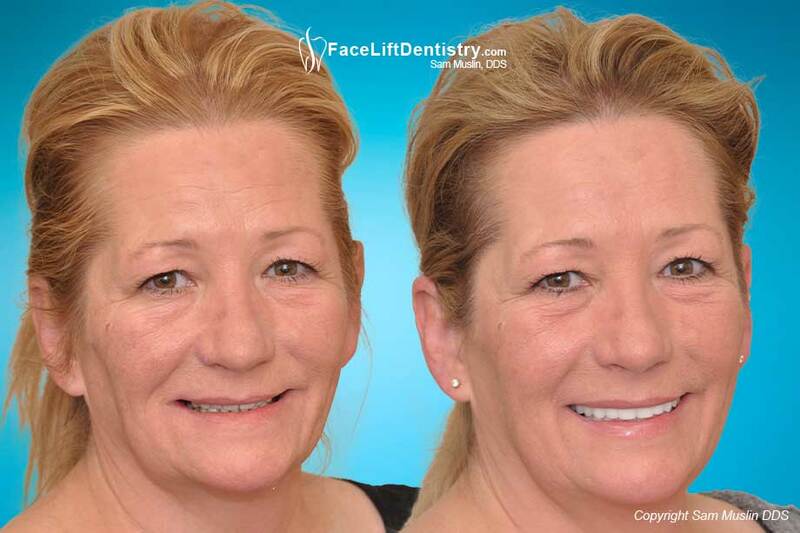 She found Dr. Sam Muslin’s unique Face Lift Dentistry® Treatment and was very impressed with his unprecedented before and after photos of virtually every dental problem. She said, “If he can help all of those patients, with deep overbites and under bites he should be able to help me”. 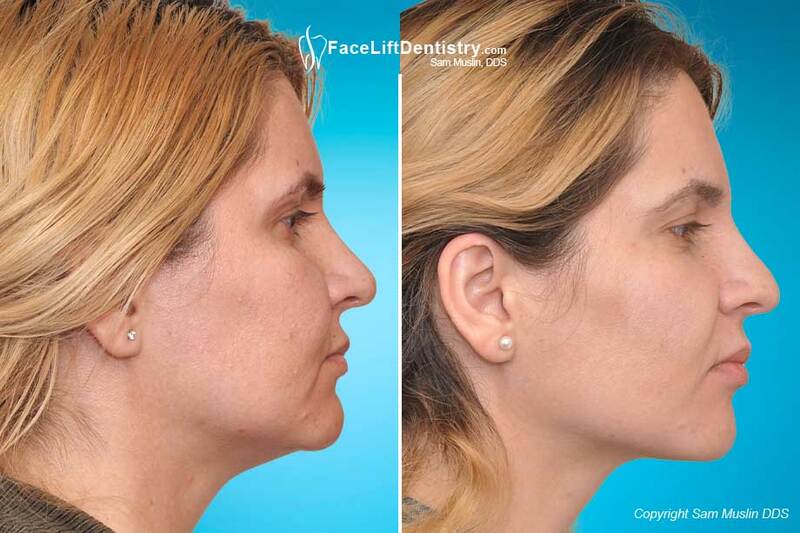 After her first consultation, she learned that she did not need facial surgery, her face would look years younger, her dental health would improve dramatically and her smile would be impressive. She struggled with her deep over bite for many years. 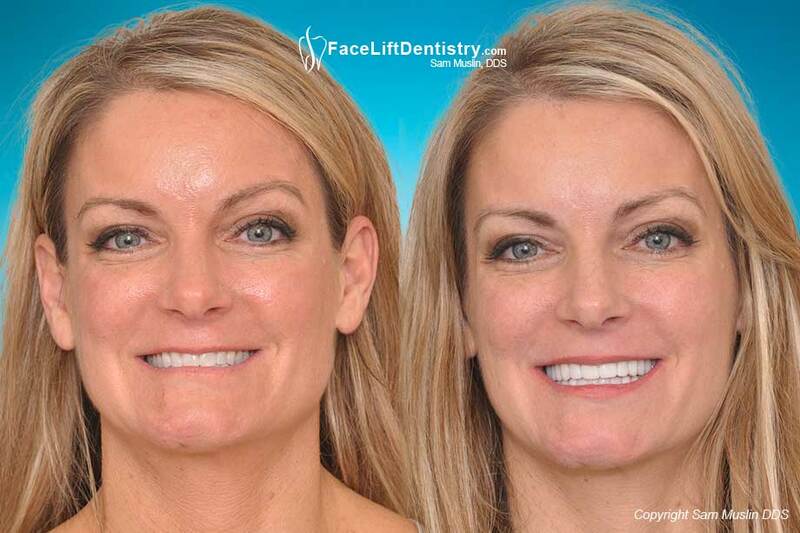 She knew that the previous cosmetic dentistry was bad cosmetic dentistry and now was told by these other dentists the only way to solve her aging face and overbite problems was surgery. She told Dr. Muslin on her first visit, “You are my last hope”. When a promising career opportunity arose, Nancy felt she needed to be at her absolute peak. But she was uncertain about where to get help about her over bite. 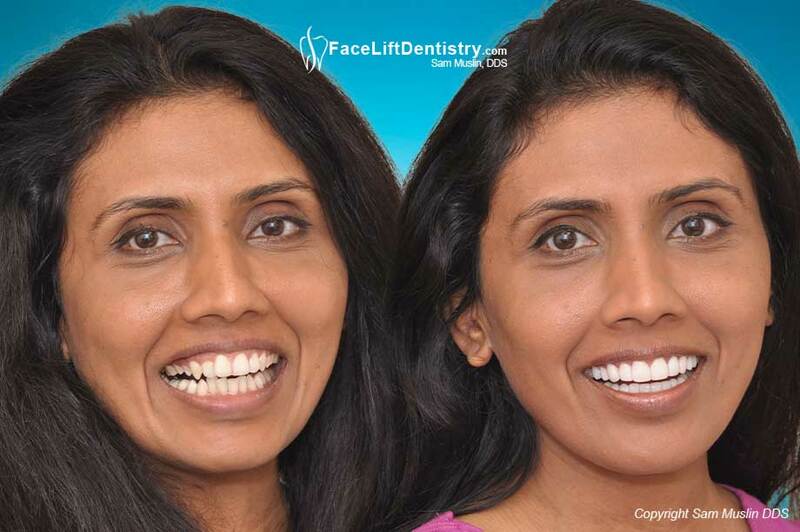 How would she find the best cosmetic dentist in Los Angeles or Santa Monica? And if truth were told, she felt a little apprehensive about what treatment for a deep over bite would entail. In fact, previous dentists said she would need jaw surgery! She was thrilled to learn that her entire treatment would only take two visits about 3 weeks apart. She said it was “unbelievable”! With results like this, she was happy to give Dr. Muslin permission to show the photos of his life changing work. She could not believe how fast the treatment was completed. 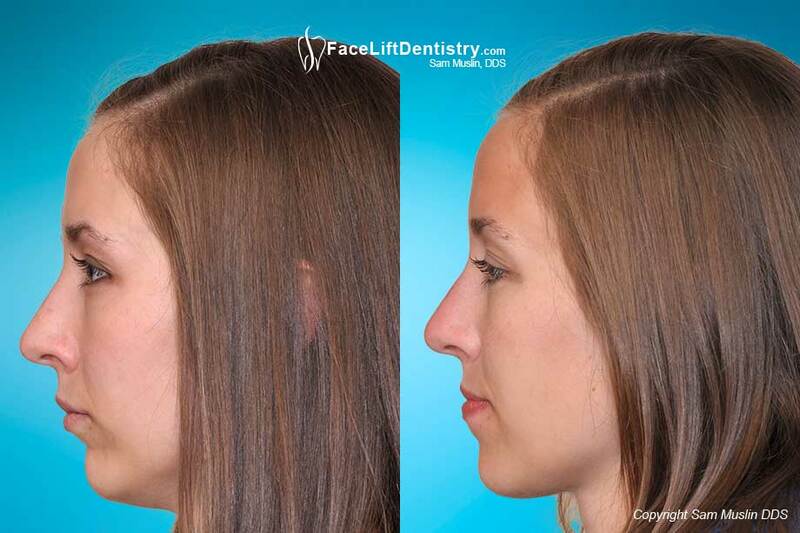 On her first visit to the doctor, she learned that her deep over bite could be corrected without jaw surgery. 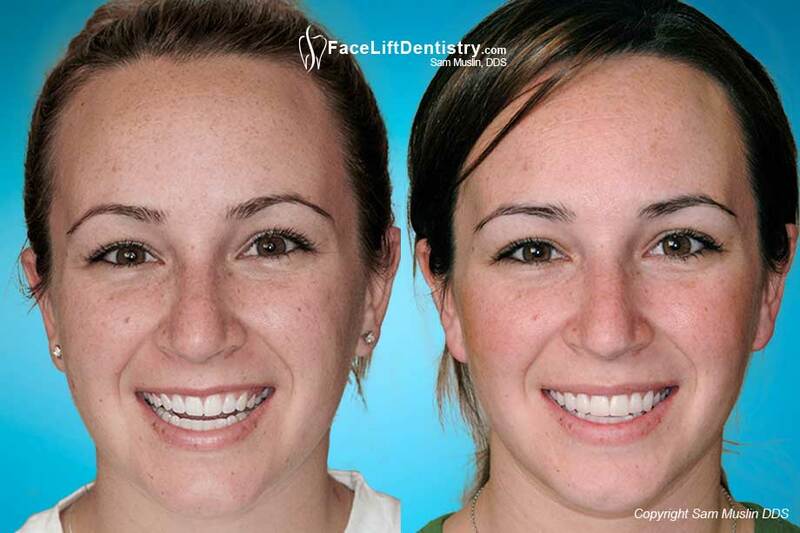 And even better, the doctor suggested her smile could be transformed in only two dental visits—about 3 weeks apart. 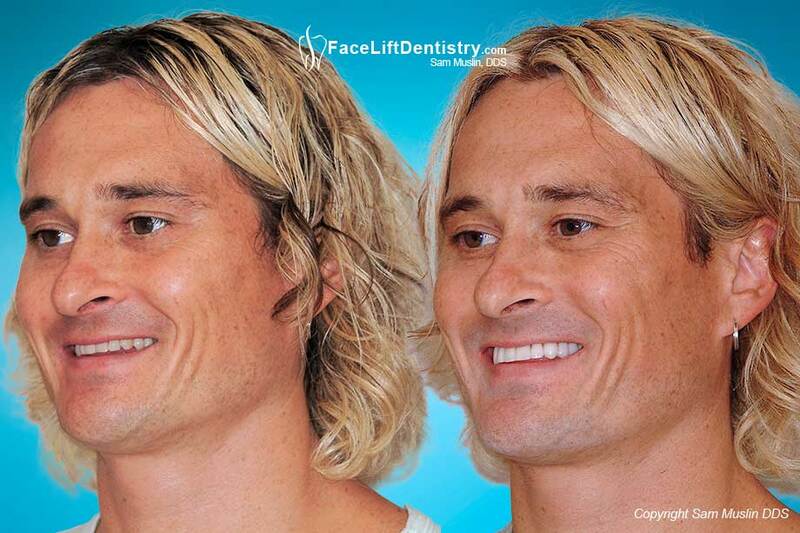 But, even better than that, all of her cavities and old fillings, porcelain veneers and dental crowns would be replaced with matching biologically compatible porcelain veneers and porcelain crowns. 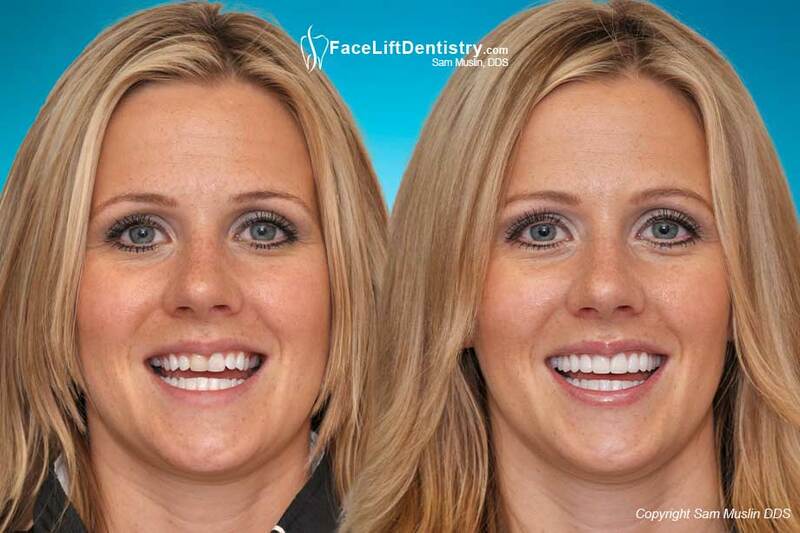 She would receive healthy biologically compatible cosmetic dentistry without surgery. 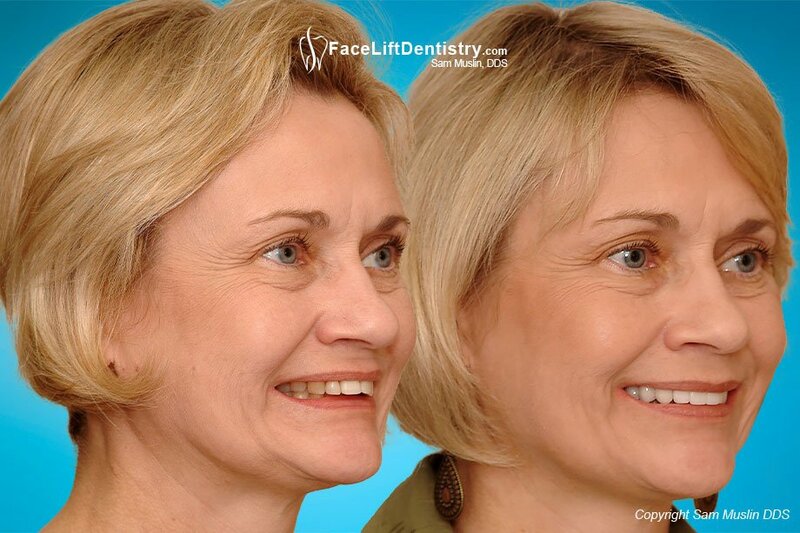 Then she discovered that Dr. Sam Muslin performed non-surgical Face-Lift Dentistry® treatment very quickly. Complex adult high tech dentistry is his area of expertise and his practice is built to deliver this level of cosmetic dental care and his unique approach to deep overbite correction is not only non-surgical but it is also non-invasive. Any teeth that are healthy and cavity free do not need to be ground down. This was an incredible advancement in modern dentistry. She said, “He is the best cosmetic dentist period”. Dr. Muslin sees patients from all over the United States and the world because he can deliver high quality dental care in a very short period of time with very few problems. He may be the most experienced dentist regarding this level of care which is why so many patients are willing to travel to experience his skill and speed. 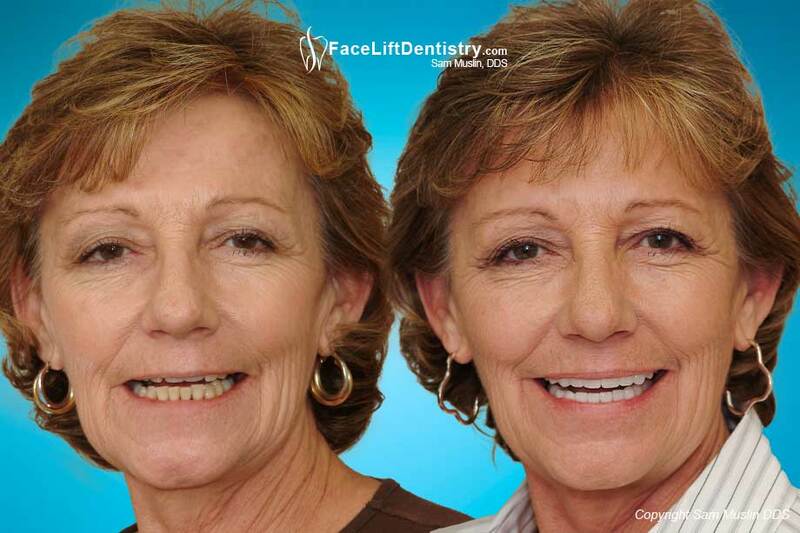 The Dental Face-Lift® has the advantage of a surgical face-lift without the surgery. 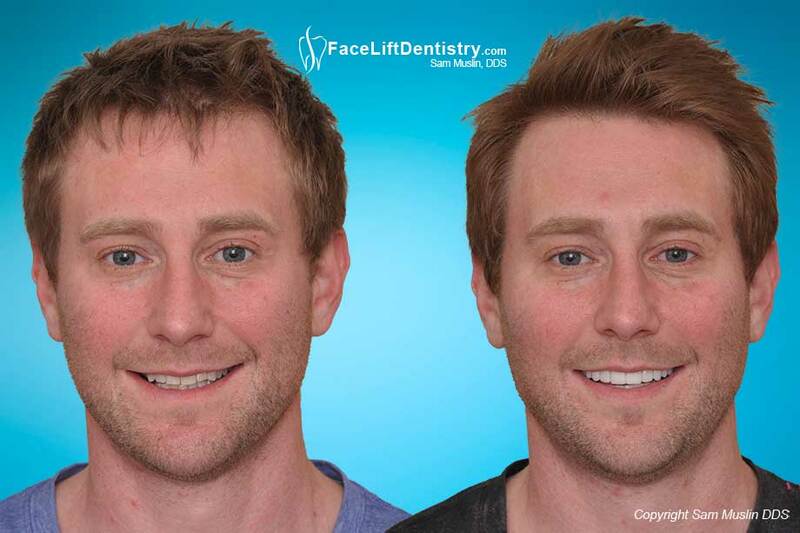 The reason Dr. Sam Muslin’s unique Dental Face Lift® treatment is so compelling is that he developed the method to predictably lengthen the face of the patient and non-surgically allow the jaw to reposition itself along with a anti-aging benefit. 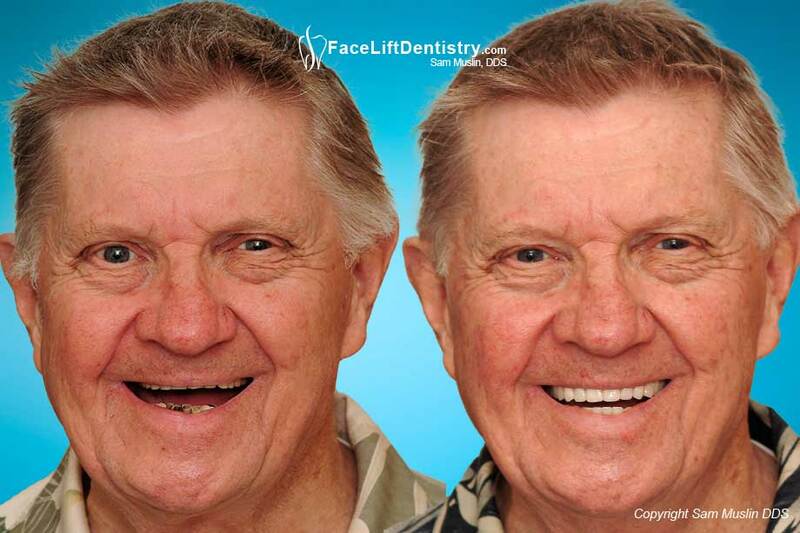 The Dental Face Lift® treatment is exclusive to Dr. Muslin and can remove 10 to 15 years from the patient’s face without surgery and at the same time greatly improve the health of the patient. 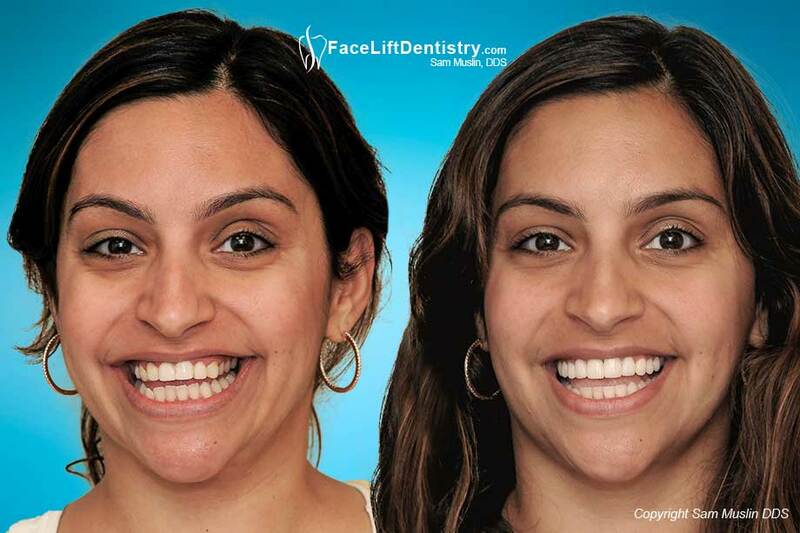 No other cosmetic dentistry procedure, face-lift, plastic surgery, facial fillers have a health benefit. 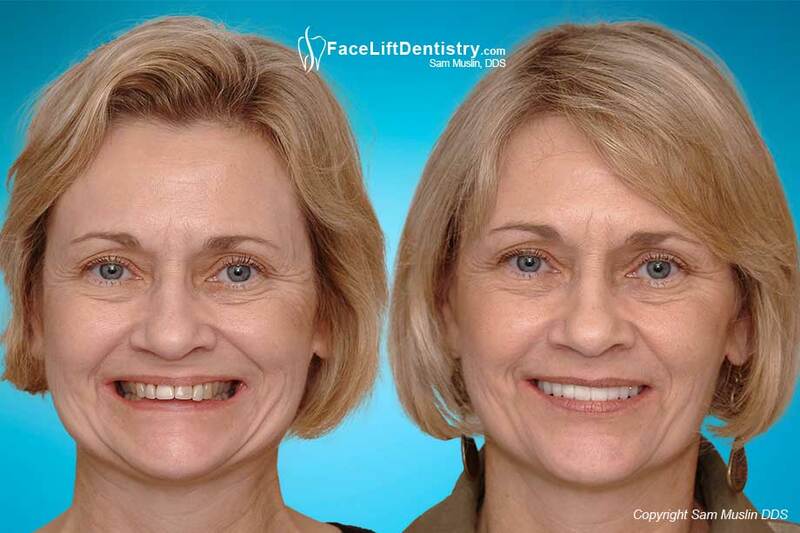 The Dental Face Lift® by Dr. Muslin, not only transforms the patient’s face but also transforms the patient’s health. The health benefits of his care reduces facial stress, jaw stress and infection that helps his patients live longer and healthier lives. 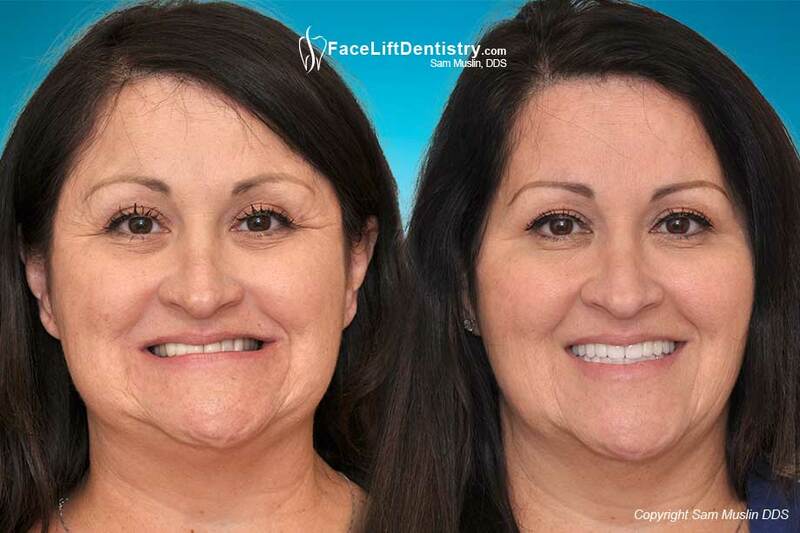 Sure enough, in three weeks, Dr. Sam Muslin's Face Lift Dentistry® procedure aligned Nancy's bite. It now matched her unique facial characteristics perfectly. 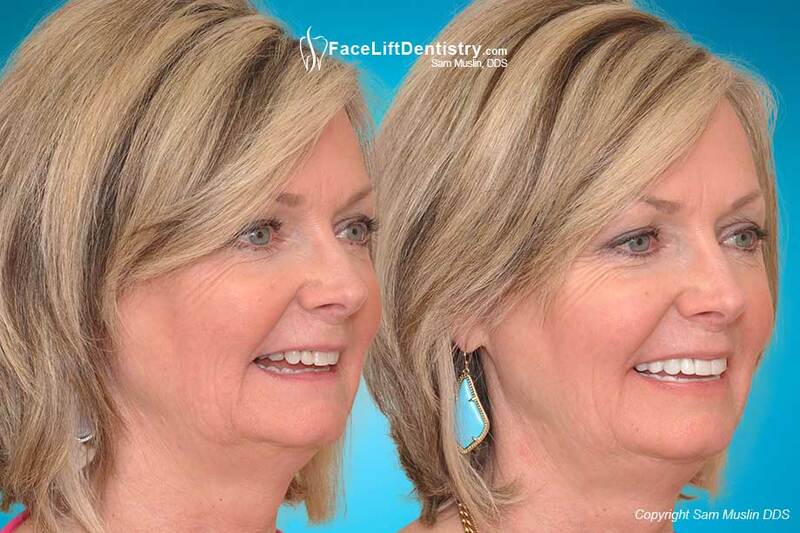 Living Longer with the Dental Face Lift® She was delighted with her new look, her smile and the surge of confidence she experienced. She felt confident in her workplace and the possibilities it held for her. 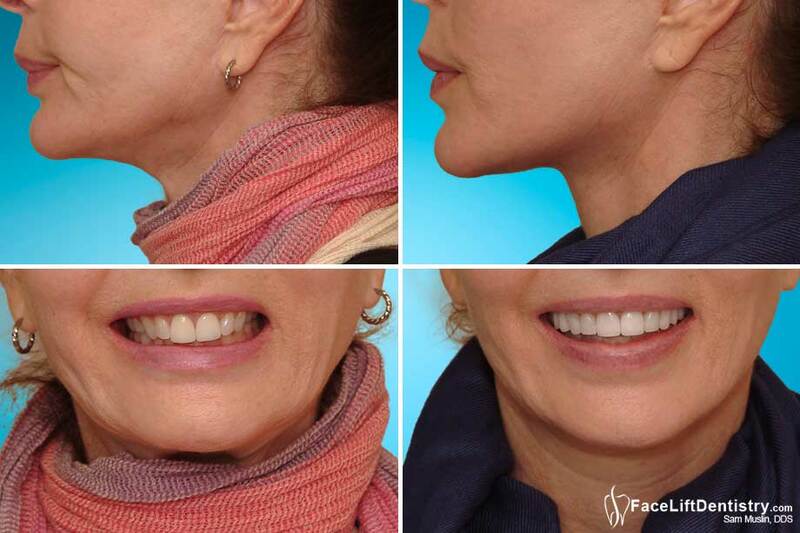 She also will live longer and require less medications over her lifetime because of the significant benefits to her health with decay and infection removal and much less stress in her jaw, head and neck with his unique overbite correction technique. Many people live with an overbite that is unfavorable for their face and jaws. And most are unaware that they suffer from this condition unless they have jaw pain or headaches. Deep overbites contribute to facial collapse and the aging face. 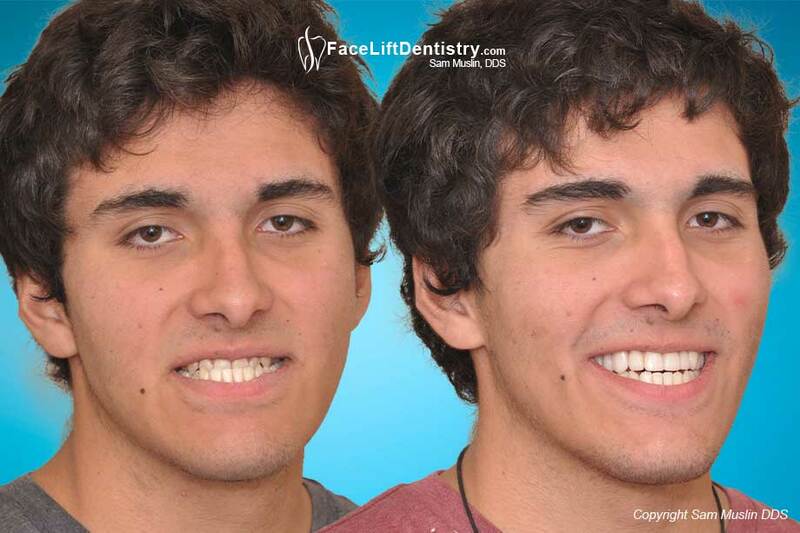 As the overbite deepens with age and time, the patient’s face looks older and the jaw position gets worse. If untreated, tooth wear continues to worsen the overbite. This eventually leads to bite collapse and facial shortening that combines with TMJ pain, headaches and old age. Once this occurs, "buck" teeth and the overbite gets worse as the patients gradually and slowly experiences facial collapse that they rarely notice because it occurs so gradually. The teeth play a big role in the shape and length of the face. So, the face can be affected when the teeth shorten. Teeth shorten with time and age. Grinding can occur more forcefully for someone with a bad bite. The subsequent wear on the teeth results in a deeper overbite and facial collapse. A shortened face usually accelerates the appearance of facial wrinkles. It makes the lips look thinner. Often the person even loses speech clarity. They look older, sound older and feel older. Unfortunately, the tooth wear is gradual, so the person usually remains unaware of how much deterioration has occurred. Most people with aging faces think that in order to look younger they need a surgical face-lift when nothing could be further from the truth. 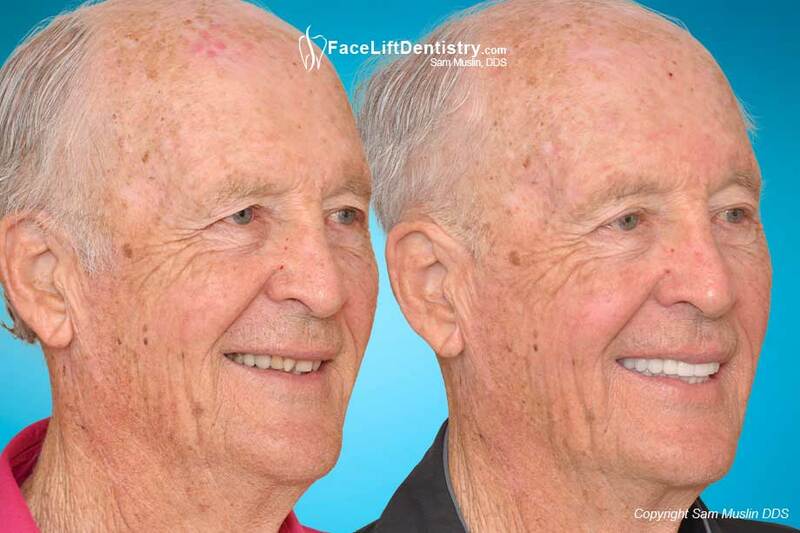 The patient actually needs Dr. Sam Muslin’s, exclusive Dental Face Lift® which actually reverses the aging process by treating the actual problem that causes the face to look old. 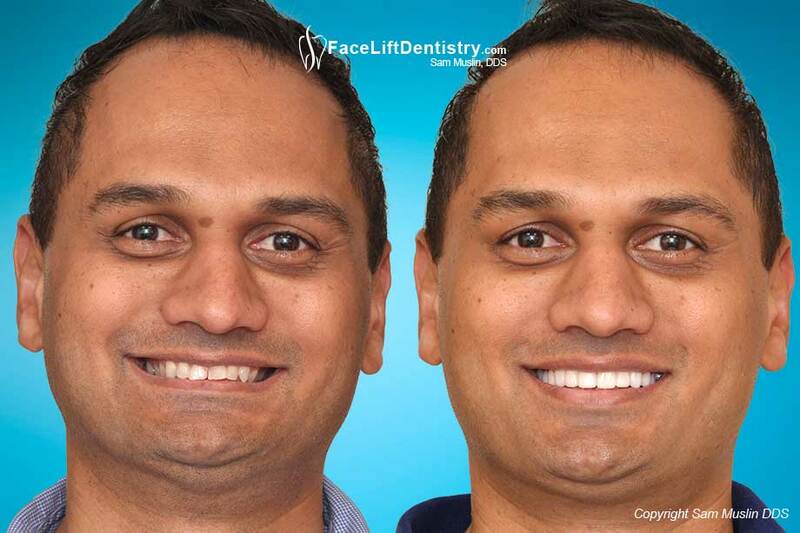 Face Lift Dentistry® reverses years of wear and bite collapse by creating the ideal facial height for each patient's facial features. In fact, within a few weeks, as much as 10 to 20 years of aging can be reduced from a patient's face while also improving the patients health. Surgical face-lifts do not have a health benefit; it is purely a cosmetic procedure. 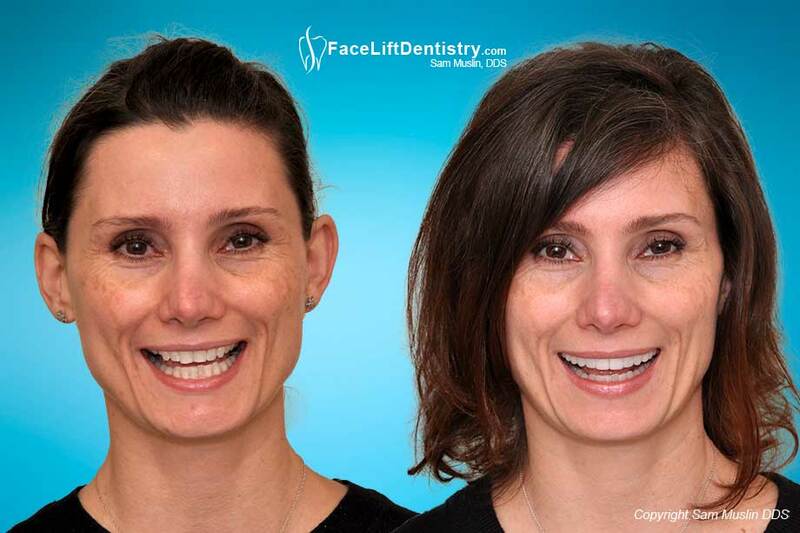 Face Lift Dentistry® treatment not only creates a more symmetrical, healthier bite, it reshapes and restores the patients face for more youthful appearance. 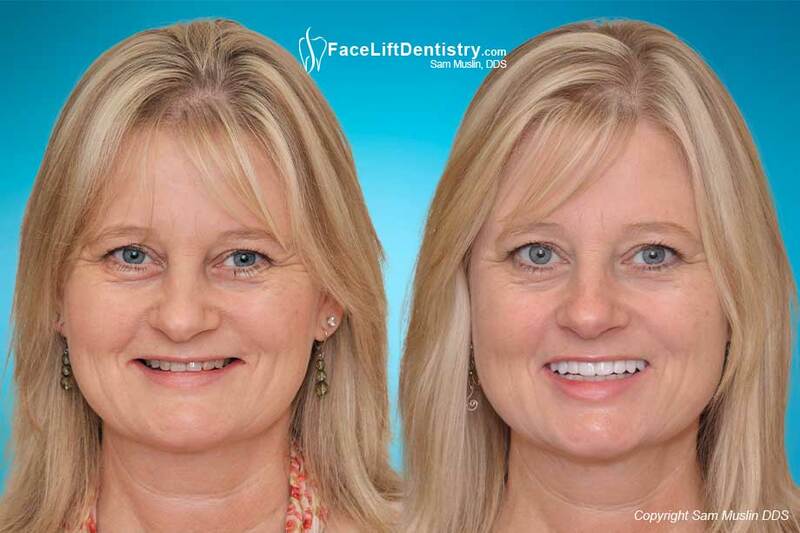 The key benefit of Dr. Muslin’s exclusive Face Lift Dentistry® treatment is a longer life with health improvements. 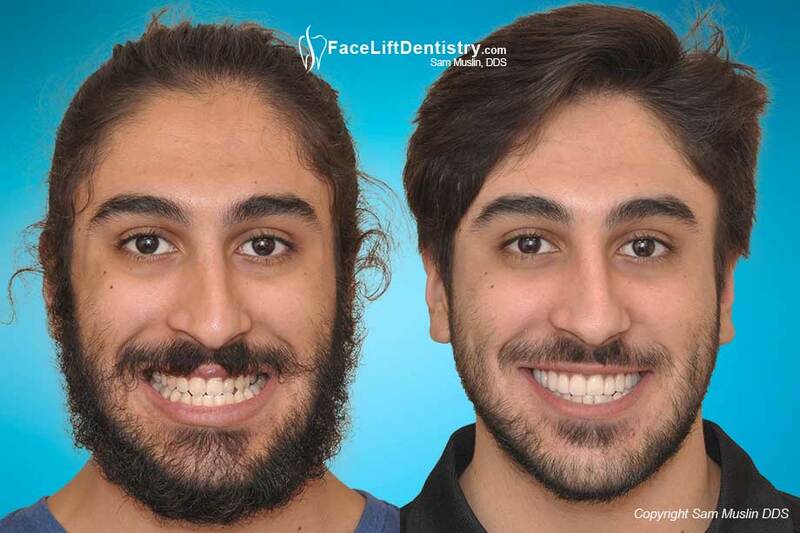 In one well-organized treatment sequence, the overbite is corrected, the dental decay is removed, gum care is optimized, the jaw is moved to a much less stressful position and the patient’s face is permanently lengthened. On the first visit, all of the old crowns, cavities and gum infections get removed. The best cosmetic dentist then replaces all of the old dentistry with temporary crowns, veneers and fillings. On the second visit, all of the new crowns, porcelain veneers and fillings get bonded. 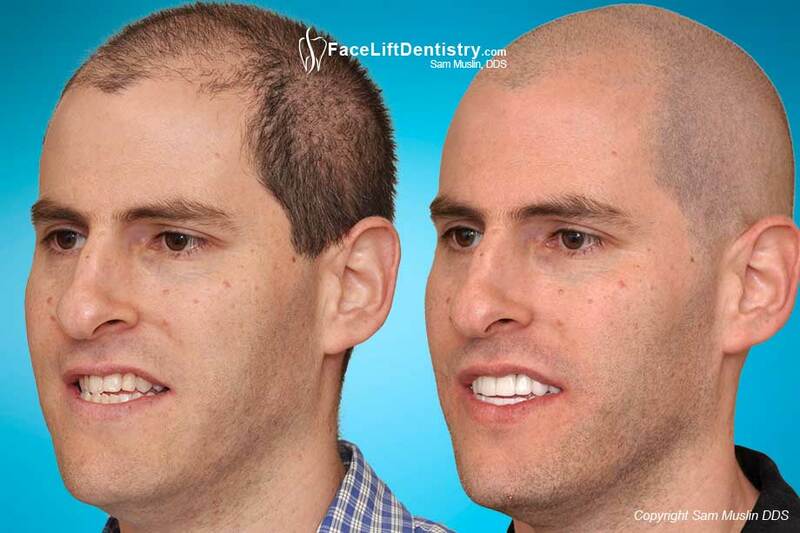 This results in a complete reversal of bite collapse, deep overbites, the patient gains permanent facial support, less jaw stress and lengthening of the patient's face. "When all was said and done, he replaced all of the old amalgam fillings, saved a couple of teeth with root canals, and rebuilt my bite and my smile. The health results, as well as the cosmetic results, have been stunning". 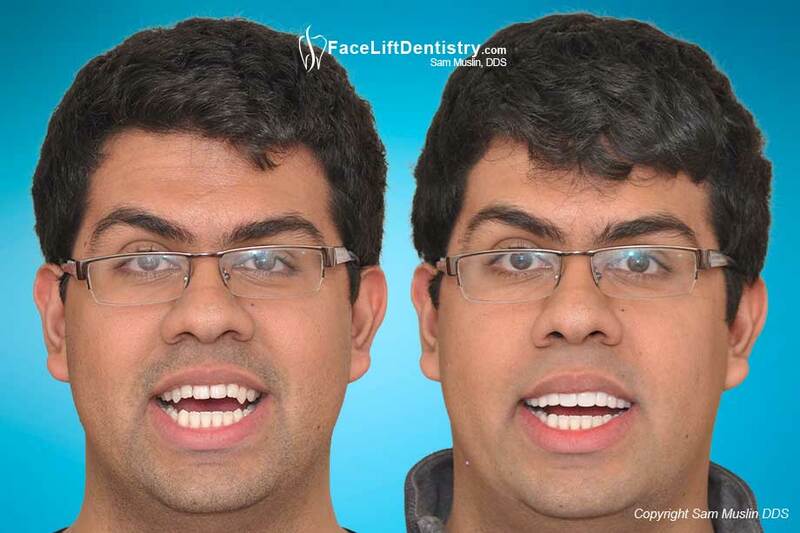 Sam Muslin, D.D.S., has developed a unique and exclusive combination of dental technologies. They reverse years of tooth wear. They establish the best height for the patient's bite to harmonize with individual facial features. 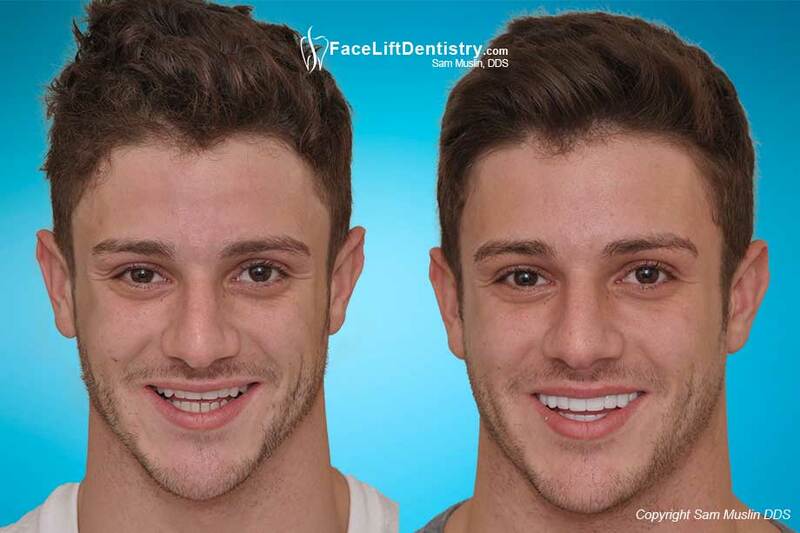 This technique combines the best dental technologies with the best cosmetic dentistry to create a predictable, natural looking result. It works with a wide variety of patients with different and complex dental needs. The treatment must be precisely tailored to each individual. This is so Dr. Muslin can construct the best possible bite to enhance the patient's health and appearance. 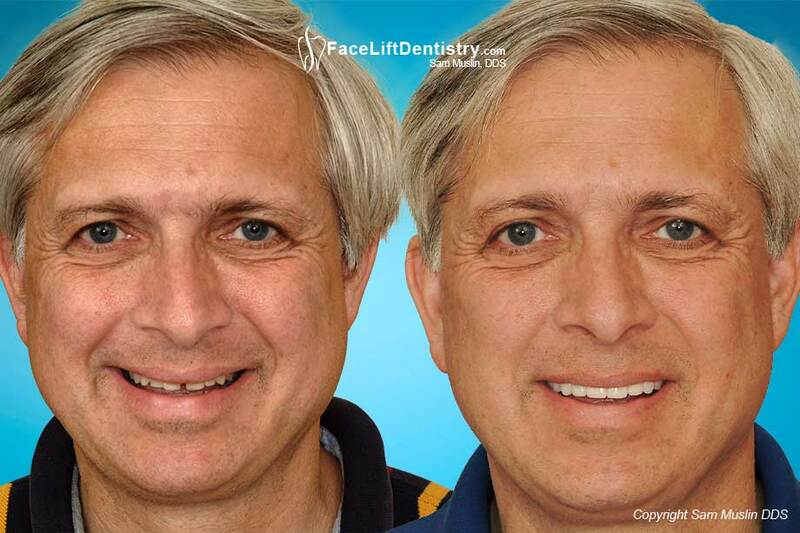 Each Face Lift Dentistry® procedure is as unique as the patient. Dr. Muslin has not trained any other dentist as he has concentrated on treatment first and will begin the training process of interested cosmetic dentists later. With over 30 years in practice and as an experienced Face Lift Dentist®, Dr. Muslin has a deep understanding of complex dentistry. His unique and exclusive care quickly creates life-changing results. For those patients who want the highest level of non-invasive, implant, and artistic dentistry, call Sam Muslin, D.D.S., M.A.G.D., for your evaluation.